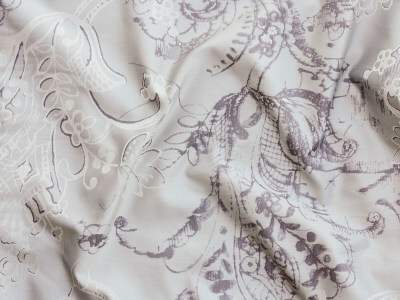 This beautiful and romantic jacquard fabric features a silvery grey background with greyish purple and ivory silver tone painterly floral large scale pattern throughout. Fabric Made in Italy. Items are custom made in Canada and usually ship in 4-6 weeks. Shams have a 1.5" flange and button back.